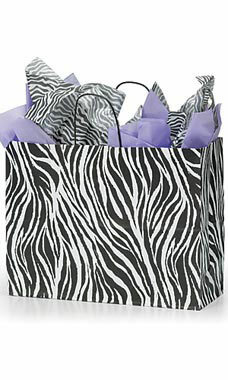 Zebra Skin shopping bags are an ideal choice for those who want to take a walk on the wild side! A stylish packaging solution is a must for today's boutiques and specialty shops. This bag is an ideal way to incorporate gift bag options by simply adding colored tissue. A versatile product, this bag can be used in a variety of ways. Case of 25.